Infantry composed the bulk of all nineteenth-century armies. Troops of this class sometimes bore the designation “toot.” Armed predominantly with flintlock muskets, infantry consisted of two categories. Heavy infantry, also called infantry-of-the-line, were trained to fight shoulder to shoulder in rigid lines of battle. Light infantry, the second class of infantry, operated as skirmishers and fought in open order. In theory, a regiment’s two flank companies-those on the right and Ieft of the regimental line of battle-served as light infantry. In practice, however, all infantry companies in the U.S. Army received the same training and functioned equally well in either role. 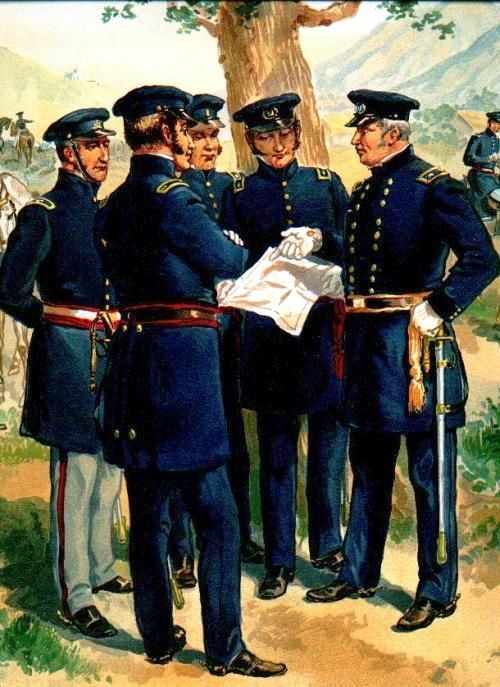 Officers instructed infantry recruits using a drill manual prepared for the army by the commanding general, Winfield Scott, and bearing the imposing title Infantry Tactics; Or, Rules for the Exercise and Maneuvers of the United States Infantry. For brevity’s sake, officers commonly referred to the manual and its drill simply as Scott’s. Artillery, too, was categorized as heavy and light. Heavy artillery garrisoned the nation’s permanent fortifications. Artillerists of this class also manned the heavy siege guns used in wartime. Light artillery had undergone revolutionary changes prior to the war. Equipped with new, lightweight, horse-drawn guns, these mobile artillerists could maneuver and deploy rapidly, going into action quicker than ever had been possible betore. Because of their speed, they were called “Flying Artillery.” Although highly effective in Mexico, only five companies-or batteries, as artillery companies also commonly were called-had been equipped as light artillery at the start of the war. Although light batteries rarely exceeded six guns, instances occurred when eight guns were placed together. Capt. Robert Anderson’s translation of a French manual, Instruction for Field Artillery, appeared in 1839 and was used to train soldiers in the methods of field artillery. In 1845, the War Department adopted Maj. Samuel Ringgold’s newer manual for light artillery, Instruction of Field Artillery, Horse and Foot, which was based on the British system. Ironically, in the Mexican War, the majority of U.S. artillerymen were organized into a unit designated the Artillery Battalion and served as infantry throughout the war. Unlike European armies, which had several classes of cavalry, the U.S. Army used only a type of light cavalry called dragoons. Armed with pistols, carbines, and sabers, dragoons theoretically could fight equally well on horseback or on foot. As an economy measure, Congress in 1842 had ordered the 2nd U.S. Dragoons dismounted and converted into a rifle regiment, an act that Ieft only one mounted regiment to cover the entire United States and its western territories. Fortunately, Congress reversed its decision and the regiment again was outfitted as dragoons in 1844, just in time to perform valuable service in Mexico. Mounted troops were referred to as “horse.” Although organized as regiments, in the case of the dragoons, a slight difference in structure existed. Squadron, a term used only in the dragoons, referred to a unit composed of two companies; no unit of equal size existed in either the infantry or the artillery. Prior to the war, Congress had established fifty privates as the maximum number allowed for a company of horse, but on May 13, 1846, the number was raised to one hundred. A government publication, entitled simply Cavalry Tactics, served as the basis of instruction for the dragoons. In May, 1846, Congress authorized an additional regiment of horse, the U.S. Regiment of Mounted Rifles. 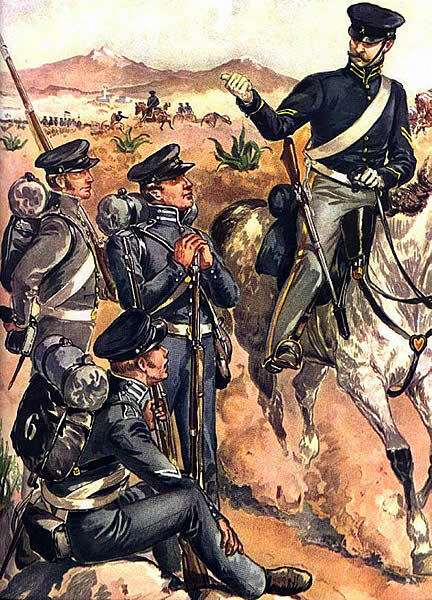 Armed with the Model 1841 Rifle in addition to the usual dragoon equipment, the regiment saw action in central Mexico as both light cavalry and infantry. Congress looked to Europe for models for the American military. A series of military disasters during the early years of the War for Independence convinced George Washington and others that the country needed a disciplined force for its defense, especially when the toe was a well-trained professional army like that of Great Britain. The legendary winter spent at Valley Forge under the tutelage of a self-proclaimed Prussian nobleman, Baron von Steuben, transformed Washington’s collection of troops into a disciplined army that began to match the British in their own kind of warfare. Von Steuben’s Regulations the Order and Discipline of the of the United States was adopted by the Continental Congress in 1779 and remained the standard drill for the American army until 1812. Manuals that replaced Steuben’s continued to be based upon European systems of drill. More than any other, one man came to represent the European military tradition in America-Winfield Scott. Born in Petersburg, Virginia, on June 13, 1786, young Scott originally intended to practice law, but the growing tension between the U.S. and Great Britain caused him to change his plans. On May 3, i8o8, following a brief period as a volunteer, he accepted a commission as captain of light artillery in the U.S. Army. Recognized for his diligence and attention to duty, Scott saw his star rise steadily. He reached the rank of lieutenant colonel in 1812, at the age of twenty-six. Assigned to the 2nd U.S. Artillery, Scott in October of that year participated in the American attack on Queenstown. There he was forced to surrender, along with the other troops, when reinforcements of New York militia refused to cross into Canada and come to their aid. Paroled the following month, Scott was both promoted to colonel of his regiment and appointed adjutant general. Like von Steuben, Colonel Scott believed in strict discipline and rigorously exercised his troops at every opportunity. Congress promoted the twenty-nine-year-old Scott to the rank of brigadier general on March 9, 1814. Appointed general-in-chief of the U.S. Army in 1841, Scott already had gained a reputation for skill in the fields of diplomacy and politics as well. During the Nullification Crisis of 1832, President Andrew Jackson sent Scott to Charleston, South Carolina, to calm passions and urge restraint. In 1838, President Martin Van Buren sent Scott to the Canadian border to try to calm hostilities aroused after pro-British Canadians seized and burned an American ship, the Caroline, killing a U.S. citizen. Returning to the Niagara frontier where he initially had made his reputation, Scott quashed attempts at retaliation while shoring up American interests in the area. Scott’s high visibility in matters such as these placed him in contact with influential persons, and by 1839 leading politicians in the Whig Party were eyeing hint as a possible presidential candidate. Scott, too, viewed himself a worthy candidate for the White House and stood ready to answer the call. Some veterans of the fighting along the Niagara who had served in Scott’s command survived budget cuts and made careers in the army. In 1825, Congress appointed Roger Jones, who had been assistant adjutant general in Gen. Jacob Brown’s division at Lundy’s Lane, to head the AdjutantGeneral’s Department. Two regimental commanders under Scott also rose to positions of prominence within the army. Col. Hugh Brady was given command of the 2nd U.S. Infantry on May 17, 1815, and was breveted to brigadier general six weeks later. Thomas S. Jesup received both his commission as brigadier general and an appointment as quartermaster general on May 8, 1818. William Jenkins Worth, who as a young lieutenant had served as Scott’s aide during the Niagara campaign, took command of the 8th U.S. Infantry as colonel on July 7, 1838. Newman S. Clarke, who acted as brigade major to one of the brigade commanders under Scott, was the lieutenant colonel of the 6th U.S. Infantry when the hostilities between the U.S. and Mexico commenced. The commander of the 6th U.S. Infantry, Col. Zachary Taylor, entered the army as lieutenant in 18o8, the same year Scott received his commission as captain. Both men were Virginians, but the similarity ended there. Taylor, who grew to maturity on his father’s estate outside Louisville, Kentucky, built a solid war record, although it seemed mediocre compared to Scott’s successes. Assigned to duty in the Old Northwest, Captain Taylor won a brevet to major for his September 5, 1812, defense of Fort Harrison in Indiana Territory. Promotion to major came on May 15, 1814, the highest rank Taylor achieved during the War of 1812. Although many surplus officers were sent home in the reduction in force that came with peace, Taylor was told he could stay on if he accepted the lower rank of captain. He declined the offer; left the service on June 15, 1815; and briefly tried his hand at farming. Less than a year later, however, Congress reinstated Taylor as a major. Climbing slowly but steadily, Taylor was promoted to colonel in command of the 1st U.S. Infantry on April 4, 1832. During the Seminole War, Taylor and his regiment were sent to Florida, where on Christmas Day, 1837, the colonel scored a victory against the elusive hostiles at Lake Okeechobee. For this action Congress rewarded Taylor with a brevet to brigadier general. It was Bvt. Brig. Gen. Zachary Taylor-the Hero of Okeechobee and then colonel of the 6th U.S. Infantry-whom President Polk placed in command of the Army of Occupation. Other differences set Scott and Taylor apart. Scott spent much of his career in the East. Cultured and refined, he delighted in the 1815 trip across the Atlantic Ocean that allowed him to rub shoulders with the elite of Europe. But success eluded him on the frontier. Sent west at the head of a column during the Black Hawk War in 1832, Scott and his men were prevented from reaching their destination by a cholera epidemic that erupted on their transport ships while on the Great Lakes. Although Scott won praise for his humanitarian efforts to comfort his stricken troops, he missed the opportunity for new military laurels. His lackluster performance in Florida elicited a court of inquiry to determine whether or not he had acted with vigor to subdue the Seminoles. The sobriquets of both men indicated the obvious differences between them. Scott, known to love fine food and fancy uniforms, early on came to be called “Young Fuss and Feathers.” As he aged, the title changed to “Old Fuss and Feathers,” indicating that his penchant for high living had not lessened over the years. One soldier who remembered seeing Scott’s camp during the Seminole War remarked that the general “required a band of music, with a company of professed cooks and servants to attend them.” These refinements, he continued, likely never had been seen before in the wilderness and included several large tents and enough furniture to fill three wagons. This “grand panoply of war,” the observer contended, was “quite unsuitable for Indian bush fighting.” Anyone who stumbled upon Scott’s camp, he concluded, “would imagine that it was the train of sonic Indian nabob rather than the requisites of a republic[an] general engaged in warfare with a wild foe in a desert country. For many Americans, including the men who served under them, the war’s two most illustrious generals came to represent two different military styles: Scott, the aristocrat; and Taylor, the democrat. Scott consistently praised West Point-trained officers who served in his command, remarking that the presence of these men increased the effectiveness of his army fourfold. “Old Fuss and Feathers” held lavish dinner parties for his officers, at which he lectured them on such topics as the art of wine tasting. His campaigns resembled those of European generals, incorporating movement to avoid bloodshed. Ironically, Taylor personally disliked most volunteers, but the press and the public linked him with the freer style associated with the volunteer service. Writing soon after the battle of Buena Vista, Col. William B. Campbell expressed his view of both generals: “Taylor is the people’s man,” contended the colonel, “and he makes an impression on the soldiery.” Campbell claimed that “Gen’l Scott,” on the other hand, “makes no such impression as Old Rough and Ready.” Scott’s main fault, thought Campbell, was that, although he was a man of “great acquirements and genius,” he was “vain and light.” Campbell hit upon the key to Taylor’s celebrity, stating, “Taylor’s fame is complete and his popularity will be as overwhelming as was Genl. Jackson’s.” Here was a hero cast from the mold of Old Hickory himself. Unfortunately for Polk and his party, this “democratic” general settled in the Whig camp. By the advent of the Mexican War, Winfield Scott, through his administrative ability and battlefield victories, had helped shape America’s regulars into a European-style army. But the transition was not yet complete. Although the number of professionally trained officers had grown significantly, many top officers had learned their lessons of war from experience, not textbooks. The homespun style of Taylor-the “Hero of Okeechobee”-still appealed to many Americans who had been reared on tales of the frontier. While the war would bring defeat to Mexico, it also would strike a serious blow at “democrats” in the army and so further professionalize the military.